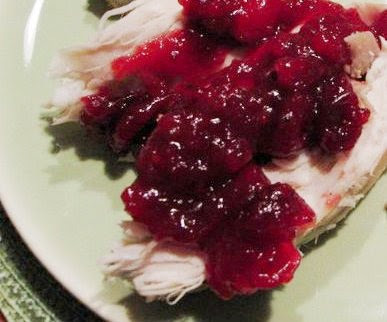 Until last Thanksgiving, I'd never eaten any kind of cranberry sauce other than what comes in the can. I'm not complaining - I've always loved the canned jelly-like cranberry sauce - and as a kid I considered it a work of art to get the whole thing out of the can in one intact log, and then slice it up into neat little slices, arranged in concentric circles in a bowl. Having become so used to the way we sliced and served cranberry sauce at home, I once mistook a pan of sliced beets for cranberry sauce at a buffet-style restaurant. I took a bite, expecting that sweet tartness of cranberries... but my mouth was filled with the taste of beets. It's really the reason I still dislike beets so much to this day. My brother-in-law's family has a tradition where they set the jelled cranberry sauce upright in a dish, then pass it around where everyone has to scoop some out of the middle. The first person to break the "wall" around the edges has to do the dishes, I think. So last year was my first time actually hosting Thanksgiving when my parents came over to our place, and I wanted to make it special. Of course we had the turkey and potatoes, and all the other usual favorites - vegetable casserole with cheese crackers (my dad's favorite), sweet potato casserole with brown sugar and pecan topping (my favorite), and lots of pie (Jamie's favorite). Never having cooked with actual cranberries before, I wanted to make a cranberry compote instead of serving cranberry sauce from a can. And after tasting that compote, I'll never go back to the canned variety! This compote is such a wonderful blend of sweetness and tartness, with hints of orange, cinnamon and ginger - it's delicious on your turkey, or could even be spooned onto ice cream or cake. Since I won't be making the compote until next week, I don't have any good pictures of it, just one fuzzy little picture I found from last year. But I don't think you need a picture to imagine how good this sauce is, and how beautiful it would look on your table. I know I can't wait to taste it on Thursday. For a fun holiday drink, I like the idea of freezing some cranberries - like little cranberry ice cubes. They look beautiful and festive, and will keep your drink cold, too. I made one of these last night, and it was totally yummy - although Jamie said it was too fruity for him. I plan to make the non-alcoholic version next Thursday, and I think my family will love it! Combine all ingredients in a saucepan and cook over medium low heat, stirring occasionally. Cook for 20-30 minutes, until the cranberries burst and the sauce thickens. Transfer to a serving bowl and serve warm. This can be made a few days in advance, stored in the fridge, and then rewarmed on the stove. Leftovers can be refrigerated for several weeks. Place the frozen cranberries in a cocktail glass. Place the ice, orange juice, cranberry juice and white wine in a cocktail shaker and shake for 30 seconds until well chilled. Strain into the glass. Top off with the 7-up or Sprite. Place the frozen cranberries in a cocktail glass. Add the scoop of sherbet. Add the cranberry juice and top off with the 7-up or Sprite.